(Nanowerk News) Experimental physicists in the research group led by Professor Uwe Hartmann at Saarland University have developed a thin nanomaterial with superconducting properties. Below about -200 °C these materials conduct electricity without loss, levitate magnets and can screen magnetic fields. The research team will be exhibiting their superconducting film at Hannover Messe from April 24th to April 28th (Hall 2, Stand B46) and are looking for commercial and industrial partners with whom they can develop their system for practical applications. 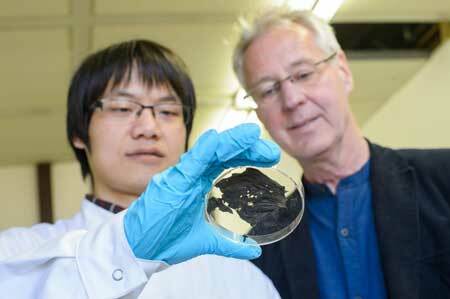 What looks like a pretty unremarkable piece of burnt paper is in fact an ultrathin superconductor that has been developed by the team lead by Uwe Hartmann (r.) shown here with doctoral student XianLin Zeng. The research work is a collaborative effort involving the team led by Professor Uwe Hartmann at Saarland University and Professor Volker Presser of the Leibniz Institute for New Materials (INM), who also holds the Chair of Energy Materials at Saarland University. The results have been published in a number of scientific journals (Superconductor Science and Technology, "Preparation of granular Bi-2212 nanowires by electrospinning"). A team of experimental physicists at Saarland University have developed something that - it has to be said - seems pretty unremarkable at first sight. It looks like nothing more than a charred black piece of paper. But appearances can be deceiving. This unassuming object is a superconductor. The term 'superconductor' is given to a material that (usually at a very low temperatures) has zero electrical resistance and can therefore conduct an electric current without loss. Put simply, the electrons in the material can flow unrestricted through the cold immobilized atomic lattice. In the absence of electrical resistance, if a magnet is brought up close to a cold superconductor, the magnet effectively 'sees' a mirror image of itself in the superconducting material. So if a superconductor and a magnet are placed in close proximity to one another and cooled with liquid nitrogen they will repel each another and the magnet levitates above the superconductor. The term 'levitation' comes from the Latin word levitas meaning lightness. It's a bit like a low-temperature version of the hoverboard from the 'Back to the Future' films. If the temperature is too high, however, frictionless sliding is just not going to happen. Many of the common superconducting materials available today are rigid, brittle and dense, which makes them heavy. The Saarbrücken physicists have now succeeded in packing superconducting properties into a thin flexible film. The material is a essentially a woven fabric of plastic fibres and high-temperature superconducting nanowires. 'That makes the material very pliable and adaptable -- like cling film (or 'plastic wrap' as it's also known). Theoretically, the material can be made to any size. And we need fewer resources than are typically required to make superconducting ceramics, so our superconducting mesh is also cheaper to fabricate,' explains Uwe Hartmann, Professor of Nanostructure Research and Nanotechnology at Saarland University. The low weight of the film is particularly advantageous. 'With a density of only 0.05 grams per cubic centimetre, the material is very light, weighing about a hundred times less than a conventional superconductor. This makes the material very promising for all those applications where weight is an issue, such as in space technology. There are also potential applications in medical technology,' explains Hartmann. The material could be used as a novel coating to provide low-temperature screening from electromagnetic fields, or it could be used in flexible cables or to facilitate friction-free motion. In order to be able to weave this new material, the experimental physicists made use of a technique known as electrospinning, which is usually used in the manufacture of polymeric fibres. 'We force a liquid material through a very fine nozzle known as a spinneret to which a high electrical voltage has been applied. This produces nanowire filaments that are a thousand times thinner than the diameter of a human hair, typically about 300 nanometres or less. We then heat the mesh of fibres so that superconductors of the right composition are created. The superconducting material itself is typically an yttrium-barium-copper-oxide or similar compound,' explains Dr. Michael Koblischka, one of the research scientists in Hartmann's group.